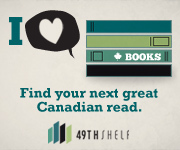 In case you don’t already know and are interested, CBC’s 2010 Canada Reads program will take place March 8–12. The program will air on CBC Radio One at 10:30 and 7:30 pm. Are you ready? Have you read any of the books yet? Canada Reads celebrates five Canadian books for three months online, at public events and on air. It all leads up to a week-long show hosted by Jian Ghomeshi. In this annual title fight, five celebrity panelists defend their favourite work of Canadian fiction. One by one, books are voted off the list, until one panelist triumphs with the book for Canada to read this year. I’ve read (and quite enjoyed) all but Generation X (even though I’ve read quite a few of Coupland’s novels and liked them) and Good to a Fault. I think I might, if I can, buy the two and read them before the Canada Reads program starts so I can participate in my own way. I love knowing the books they’re going to be discussing, and I can say right now, it’s going to be a hard choice. If I had to pick the winner of the ones I have read here, I’d say The Jade Peony, even though Nikolski really blew me away only recently. Wayson Choy’s writing is just so powerful and poetic, his characterization so real and concrete. He also treated the serious and important subject matter with humour, which is something I admire of Thomas King as well. The subject matter of The Jade Peony, from what I remember (it’s been years since I read the book and led a Chapters book club on it), gave voice to what must have been the experience of many Chinese immigrants in BC. Also, the format of the novel, three perspectives, worked very well to portray how adapting to immigrant life affects each in a different way. Not to discount the ones I haven’t yet read, of course, but this book’s won quite a few awards and accumulated very high praise. Its subject matter is part of Canadian history and identity. It would be no surprise to me if it was the Canada Reads winner, too. Still, not one of these contests has been easy. Looking back to previous shows, the lineups have been impressive, each book a significant contribution to Canadian literature. In that case, perhaps it’s anybody’s guess, until we actually hear the show. It’s been forever since I read a good mystery. Way back, I used to devour Agatha Christie and the like, and I do enjoy a good puzzle, especially murder mysteries, but for some reason, they just haven’t appealed much to me lately. I think the last I read might have been Joanne Harris‘s Gentlemen and Players (which was excellent!). Or maybe The Angel’s Game, by Carlos Ruis Zafon, if that can be considered a mystery; it’s hard to classify that well-written page turner. This evening, though, we were grocery shopping, and no matter where I am or what our focus is, I check out the books if there are any. So I broke off from C, who was picking out veggies (boring! ), to peruse the novels. I’ve seen this book before and even picked it up once elsewhere: The Sweetness at the Bottom of the Pie by Alan Bradley. An unusual and intriguing title! I must not have been in the mood before, however, because I put it back. This time, though, the matte, textured paperback cover attracted me and then so did the blurb on the back. I checked out the author’s bio. He was born in Toronto (cool, he’s Canadian), raised in Cobourg (holy crap, that’s only a half hour away, so even cooler) and then I read that he now lives in Malta (where my parents live and the country of my heritage) and that clinched it for me. Three great facts in a row, bang bang bang, together with the intriguing storyline and protagonist, and the book was in our cart within perhaps five minutes. Sometimes I read a book’s cover, then bits and pieces of its insides, and also the author’s bio. Sometimes I hem and haw and weigh the book in my hands, trying to decide, because not only is money a factor, but I also hate to regret a book purchase. For this reason, I very rarely do. And then sometimes a purchase is as effortless as the easiest thing you can imagine. Either it’s premeditated or I’m just that quickly sold, upon inspection, like tonight. I can’t wait to read it. And if I really like it (which you’ll find out one day when I write the review, but first I am trying to write about Nikolski—it’s been difficult. The book is so good, all I could think was how good it was! ), the sequel to Bradley’s first, The Weed that Strings the Handman’s Bag, is coming in March! UPDATE: I just read that Quill & Quire picked this book as one of the most memorable of 2009! Hooray! What’s more, Bradley’s mapped out FIVE more books in the series! It might be the optimist in me but I like to believe that businesses don’t fail, people do. I’ve heard this somewhere, and it rings true for me. I’m not pointing the finger whatsoever, but the fact remains that there are indie bookshops still actually opening and surviving regardless of the devastating effects of box stores and burgeoning technology. I want to believe that if I’m properly educated in how to run Biblio and how to differentiate it from other shops, and I act on that education and continue to learn, I won’t fail. Almost every single day I read news of yet another independent bookshop closing. It’s both sad and frustrating because these shops have been significant in their community, most of them for a very long time. David Mirvish Books, one of Canada’s oldest bookshops and possibly the most most popular visual arts, photography, and design bookstore closed almost a year ago after 34 years of operation, opting instead, like many others, to sell their inventory online (Miller, Toronto Star). The very popular Pages in Toronto closed its doors after 30 years this past August due to impossible rent increases (Levack, Toronto Notes). A couple of weeks ago I saw that Duthie Books in Vancouver had written a rather bitter- yet devastated-sounding announcement that they are closing their last shop after 53 “(mostly) happy” years, due to competition. And today I read that Prime Crime Mystery Bookstore in Ottawa, an award-winning specialty shop in the Glebe, is closing its doors in March. The shops are closing for many reasons: the economy, the box-store competition, the rising popularity of the ebook and ereaders, it’s just time to retire and no one has offered to buy, rent is increasing beyond affordability, etc. They’re all very real and very valid reasons to close up shop. But something keeps telling me that if I have a great business plan in place, one that is well-advised, takes into account what works, and considers the future, but one that is also constantly reviewed and adjusted if necessary based on keeping abreast of the industry, and if I educate myself well enough and keep learning and participating in the literary community, and if I don’t give up and let the media coverage get to me, I can make a go of it. I’m willing to take that risk because I hate the alternative. I don’t want to contribute to the bookshop “depression” by not opening Biblio out of fear of failure. This might sound counter to what I just wrote about staying abreast of the industry and growing with it, but I’m also hoping that I can stand for what I believe in—that is, the value of a “real” book—and still be successful. I can’t help but refuse to buy into the techno hype surrounding the tiresome ebooks and ereaders. I know there are others like me for whom the lure of saving space and even money falls short. I’m certain I’m not the only person who derives great pleasure from the fragrance of ink and paper, the art of a beautifully bound volume or set, the warmth of a book as opposed to the coldness of technology. If I were an author, I’d want to hold that tangible novel in my hands, fan its lovely deckle-edged pages, and breathe in the fragrance of a dream come true. I’d want to sign pages to readers with a lovely pen; I’d want to see that book on my shelf and the shelves of others. Stephen King is apparently some kind of huge proponent of ebooks, but after writing so many books he can’t even remember having written half of them, what’s another newly bound novel? The thought of a group of book club members sitting in a cozy circle discussing Geraldine Brooks’s People of the Book while clutching their Kindles or iPads seems ridiculous to me, and somewhat sad. There’s something lost there. But that’s because when I discuss books I like to be able to have access to that book in every possible way. I love to run my hands over a matte or cloth cover, to flip through the pages, to weigh a novel’s heaviness in my hand. The ereaders are just no match for the real thing. Perhaps people like me are dismissed as behind the times, sentimentalist, romantic. So what if we are? We’re also lovers of a certain art and history; we appreciate the creative process that goes into making a book. And we value a different sort of practicality. I think of books as more accessible than technology, less discriminating, and just easier for people of all ages. We booklovers want something we can trust—and often readily own. I just think technology can be unreliable, no matter how well it’s engineered. Sure, it’s convenient in many ways. But there has been many a time when I’ve wanted to toss this laptop out the window even though it’s only a year old and a good one, and countless occasions at work I’ve wasted time waiting for a program to reload after a crash while a customer stands impatiently before me. Technology is fallible. Its growth rate is exponential and you have to keep up or it becomes useless. It’s expensive. It’s limited. There will be glitches. You might be in the middle of a terrific chapter when your battery runs out and you’re nowhere near a charger, or perhaps you’re a writer giving a reading and suddenly your ereader won’t load your book. I mean, what if? Then how happy will you be about this hand-held piece of convenience when you could have simply turned the page or flipped to where your Post-it Note indicated? Really. How inconvenient is a book if you only need one at a time? Besides, over the next twenty years or so, it’s the baby boomers who will be doing most of the buying still anyway, so regardless of how obsessed younger generations may be with technology, books will still be purchased. And people will still enjoy the sensory and tactile experience of shopping in a store rather than online. They’ll also frequent bookshops for all the other things they offer, for that tangible sense of a literary community. I don’t believe that “normal” books and indie bookshops will die out altogether. People will still want them. Thus, someone has to provide them. One of those someones will be me. But for those who need something more convincing than sentimentalism and romantic notions, read Margaret Atwood’s Three Reasons to Keep Paper Books, and More on Keeping Paper Books. She argues better than I do (and writes better, too). More importantly, she rationally presents her points, and then, like a good debater, backs them up with credible sources. The point we both make is, there is value to the traditionally made books. And I say that its up to those of us who feel passionate about that to keep buying, selling, and reading them. …the first chapter of the new book you’re reading is so excellent you already regret the arrival of the end? Page 18 of 287 of Nikolski by Nicolas Dickner, and I can see why this book won the Governor General’s Award! Great stories are so exciting!! And I do reserve a special place in my heart for translated literature. I look forward to reviewing this book for you! I just got back from a few hours at Chapters. This trip has been long in coming, since December 28th, when I got my gift certificate from my boss. And yes, I spent a few hours! Colin was bored after less than one hour, and this is why I really should go alone. But he does enjoy buying books as well, and that is always something I feel I should encourage. First, I forgot my list, which is always bad news because I’m so easily distracted. Of course, I could hardly remember what was on it, and to my disappointment (but not surprise), most of what I did remember wasn’t on the shelves. I find this often. Maybe I just don’t read or favour what the general public does? In the end, having Colin do the math about six times for different piles of books, I decided it wasn’t a big deal if we went $60 over. I pulled out my Chapters card, a coupon for $5 off, and my $100 gift card to pay. And then the extra sixty. 1. The Bedside Book of Birds – Graeme Gibson, which is an absolutely stunning collection of artwork and literary pieces about or including birds. It’s a gorgeous book. Though its companion, The Beside Book of Beasts, is 30% off right now, I want to have both of them in softcover, so I decided to wait on it. 3. Nicolski – Nicholas Dickner. I’ve been eyeing up this book since it came out in 2005. Later it won the Governor General’s Award and soon it will be discussed on the upcoming Canada Reads program. I decided not to wait to hear it be defended and instead finally went with my gut. I was just as excited about this cup as I was my books and couldn’t wait to brew tea so I could enjoy it in my new purchase. When we got home, though, and I opened the box, I discovered the mug was chipped. I’m still raging about it. I know I can return it but that’s beside the point! I’m so disappointed, and I’m also a bit of a child: when I want something, I want it now. I don’t want to wait to get a new one (but I’m going to)! It just took away some of the pleasure, if you know what I mean. I really hate getting home to discover something wrong with what I bought. My coffee table book has a banged up spine on the bottom but I’m all right with it, it’s minor, and my books aren’t perfect. But the mug, well, that does have to be perfect. It’s not as though Chapters is just down the street, either; it’s kind of a pain to drive there. But I will anyway, probably tomorrow. The anticipation of enjoying such a cup with my new books is too great not to go. I can’t resist the book prices at Costco, even though the buying experience is nothing like what it will be at my bookshop. Still, no matter where I am, at Costco, Chapters, an independent bookshop here or in a village in North Yorkshire, the pleasure of purchasing a book is unparalleled. Today I bought two books I’ve been long awaiting: Committed, by Elizabeth Gilbert (sort of sequel to my beloved Eat, Pray, Love, which I’m waiting to be given because I’ve given away about eight copies now and almost every one of them was my own first, so now it feels as though I can’t buy this book but have to receive it as a gift), and The Swan Thieves, by Elizabeth Kostova, author of one of my favourite books, The Historian. I can’t wait to read these! I might have to dive in before I finish Ferguson’s book (sorry, Will!). I bought two others, as well. I couldn’t resist! One was Clara Callan, by Richard Wright, which I read years ago and enjoyed very much. At the very least, it won the Governor General’s Award and the Giller and the CBA Libris Awards Book of the Year. This edition is one of the nicest I’ve seen and it matches my editions of To Kill a Mockingbird and A Tree Grows in Brooklyn. That kind of thing makes me quite happy! And the fourth is called A School of Essential Ingredients, by Erica Bauermeister. I hadn’t heard of the book or the author before today but I love books that contain scrumptious descriptions of food and the storyline sounds intriguing and very character based. I enjoy a motley crew of sorts (one great example I can think of off-hand is the group of characters that meet on a rooftop in Nick Hornby’s A Long Way Down), and in a kitchen no less! So I’ll take a chance, as I often do. I am almost never disappointed. Still have a hundred-dollar gift certificate to spend at Chapters, which I plan to do this weekend! I can’t wait! !